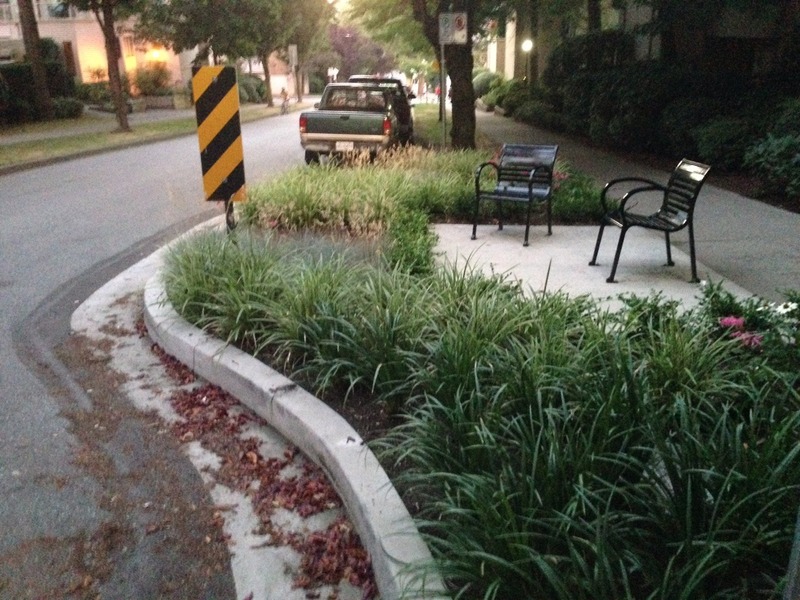 It’s exciting to see cities taking the idea of the ‘park’ and extending that into the street. As cities get more and more built up and land for new parks is difficult to find, we are going to have to leverage the public space of our streets and redesign them to do more than just move cars. Vancouver’s Comox-Helmcken Greenway, which connects the West End and English Bay to the Hornby separated bike lanes, is a great example of turning a street into a place to linger, rather than just move through. The next phase extends it into Yaletown. The idea is to take a relatively low traffic volume street and enhance it for cycling and walking, bringing a park-like experience to a street while also connecting many green spaces together. To do that, the City has not only put in some separated bike lanes where needed, but they have installed street furniture like tables and chairs at different spots along the way and created small rain gardens and other street gardens to bring more greenery into the street and help with storm water management. From the signs I saw on some of the new little gardens, they are maintained by nearby neighbours. (The white picket fence garden has a message from “Michael” asking people not to pick the flowers.) New bulb outs on the street slow down cars further and help pedestrians cross the street by narrowing the width they have to walk. During my week long stay in Vancouver, I found myself drawn back again and again to the street. It is an incredibly pleasant experience to ride your bike or stroll along it. Despite the fact that it is still a street, it does have the feeling of a linear park.